The Cavs are already being rewarded for addressing their lineup depth as their bench scored 50 points in Cleveland's win over Memphis. Injuries and a suspension force the Cavs to look to their experienced yet seldom-used reserves to help overcome the adversity they knew was coming. Cavs starting PF Kevin Love could be out for a while due to the shoulder injury. It wasn't all about the Big Three. Cleveland's support team helped key a big Game 1 win for the Cavaliers. The Heat, who missed the playoffs, failed to live up to expectations in their first season without LeBron James. 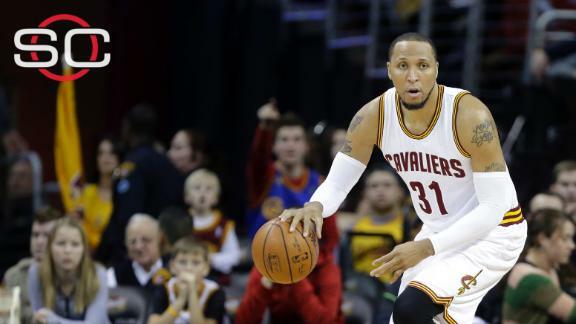 DALLAS -- One by one, the All-Stars from the Phoenix Suns’ "Seven Seconds or Less" era are riding off into the sunset.First, Shawn Marion announced that he’d retire at this season's end, the Matrix’s 16th in the league. MILWAUKEE -- Some 2,000 miles away and 24 hours removed from the point in time when Steve Nash, from his ocean-side home in Manhattan Beach, California, announced to the basketball world that he’d played his last game, the NBA went on without him. DALLAS -- Barring a Mavericks-Cavaliers matchup in the NBA finals, Shawn Marion will never again put on a uniform in the American Airlines Center.However, Marion will hear the roar of the crowd there at least one more time Tuesday night during the Cavs’ annual visit to Dallas, when he’ll watch from the Cleveland bench while continuing to nurse a strained hip that has sidelined him for two weeks. CLEVELAND -- In what’s becoming as common occurrence as turning on the TV to find a "Seinfeld" rerun, the Cleveland Cavaliers won again Saturday. DALLAS -- Al-Farouq Aminu has a multi-faceted role for the Dallas Mavericks.He gets minutes at three different positions and has been asked to defend everyone from point guards to centers. MIAMI -- Disgruntled as a result of his diminished role in the Phoenix Suns' forced three-guard rotation, Goran Dragic desperately wanted out of Phoenix. CLEVELAND -- Iman Shumpert and his easily-distinguishable flattop were being given the postgame walk-off interview treatment on Wednesday when LeBron James and Tristan Thompson popped up behind him and pretended to fix their own hair as they preened for the camera. Baxter Holmes details how Gregg Popovich has used team meals to build camaraderie with the Spurs. Stephen A. Smith and Max Kellerman disagree if Kawhi Leonard should join LeBron James with the Lakers.